Portable bright LED lamp includes 24 long-lasting LED bulbs. Touch power switch features 3 varying levels of brightness, 30%, 50% and 100%. 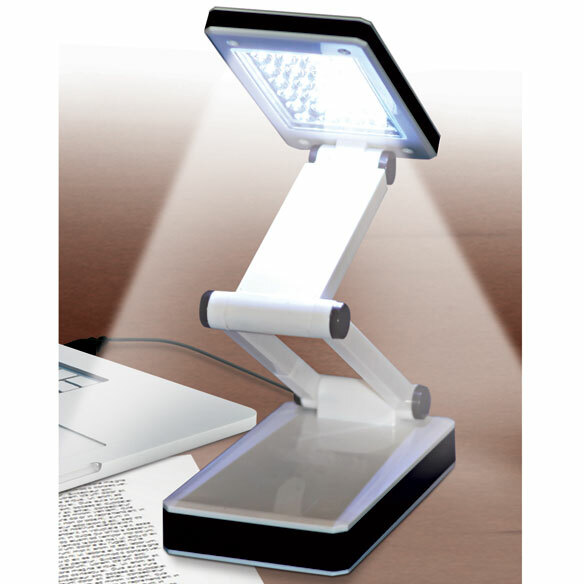 LED desk lamp's space-saving design is ideal for use in the home, office or for traveling. 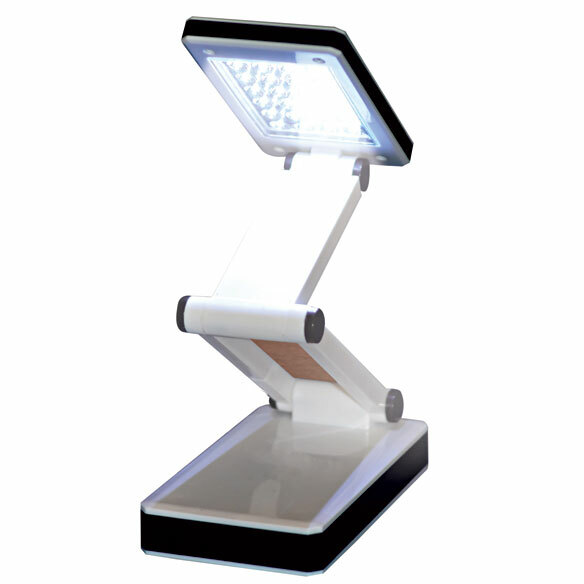 LED reading lamp measures 5”H x 3”W (10.5”H when extended). Powered with USB cable or 4 AA batteries (not included). Song wanted this to use in his van when he travels. He also likes that it folds to fit in his hiking backpack or shorts if he camps out. Very good value and the light was brighter than expected. Excellent for the visually impaired who do close, detailed work &/or crafts. Can aim the light right where it's needed. Very compact for travel,working late when partner needs to sleep. I use this at my computer. Perfect !! I use it too have just a little light at night..put on the lowest setting it great..
Used it while doing a jigsaw puzzle, sewing, and to find a pill that I dropped on the floor. It is a neat little package when folded or it sit on a flat surface with the light directed where you want it. Very handy. I use this lamp at vendor shows to show off my jewelry and fine crystal. It really brightens them and makes a great show. Other vendors have asked me where I got it. I've been looking for this. No electric cords to mess with and batteries last a long time. I love this portable LED lamp. It is great for puzzles and reading too! Extra light source where electrical wiring is not available. This little light is exactly what I expected. Portable, lightweight and just enough light. I have purchased other lights like this at 3 times the cost, the light provides excellent coverage, going to buy a couple more to place in different rooms in case of power failures, much better than a flashlight. I have brought other battery lights in the past this one is the best so far, very happy with the brightness levels. You can really see what you're doing. I'm going to buy more. Buy these you won't be sorry. Bought this light to use at my kitchen table when I put on makeup. It has 3 levels of light settings and is very bright. Nice shape and easy to adjust and move around. It's basically a flashlight on a lamp stand. No cords, all battery. Use this product for reading. Light, bright, and priced right! Easy to move and use. Provides a bright spot in poorly lit rooms. I am ordering more of these. I keep them in each room to use if we have the electricity off. My son wanted this for camping out and reading in his van. He liked the idea of the way it folds. Though it is thicker folded than he expected it will still easily fit in his hiking pack pocket or his pocket on is shorts/jeans. Mostly he plans to use it inside his van but he's happy to have it so reasonably priced! This will be great for close up projects or reading. Even though I ordered the wrong product this will be great gifts. I was supposed to order the 20 LED super bright lantern with dimmer. This is great to use in the RV since it doesn't use 110 power. Plenty of light for quilting/hand sewing and reading too. My son intends to carry this when he is traveling in his van, but also on hikes. We are impressed with how bright the light is. It folds a little thicker than he hoped, but it still fits in his hiking backpack or large pocked on his hiking shorts. Great value for a lot of light. Small footprint, compact, versatile , with 3 levels of light. Very happy with new purchase. Didn't Even Last A Month! I bought a few of these, and they were good lamps, but one of them went out for no apparent reason after I connected it to the USB 2.0 port of my laptop, and then after that it went out, I tried to turn it on, and it still gave up the ghost. Do not buy not worth the money does not light anything and once you put the batteries into the unit it does not shut off. This was a piece of junk, it didn't work at all either by batteries or ac adapter. I was looking for a small battery operated light and thought this would be great. Boy was I wrong! Don't buy this piece of junk. I'd return it it, but I don't think I should be paying to send it back since it arrived defective. so I can read when the power goes off. I do a lot of crafts and sewing. Should be good for fine work. I needed a private light for editing photo orders and instead of turning on the light at night waking up my partner, I would rather have a small light handy for desk applications. I need it to read a book while on vacation. Need extra light on my night stand and this looked like the perfect size. These are perfect for camping when you need light but do not want it to shine in your eyes. I use this lamp next to my chair where I crochet. Sometimes at night, dark colors are hard to see and this lamp allows me to see perfectly. I am very pleased with the first one I purchased, so I decided to order a back-up. BEST ANSWER: Thank you for your question. It uses 4 AA batteries. We hope this information will be of help to you.